Having passed through a lot in life, Pom Klementieff has built courage in her misfortunes and has made a name for herself in the movie industry. She is a Canadian-French actress who gained fame in the film Guardians of the Galaxy Vol. 2 (2017) and Avengers: Infinity War (2018). Pom is not one of the popularly known actresses in showbiz but in her little way, she has charmed her audience with her personality. This article contains detailed information on everything you should know about the charming star. The Canadian-French actress was born on 3 May 1986 in Quebec city. She is of a mixed ethnicity as her mother is a Korean and her father is French-Russian. Although her parent’s name is yet known, we know that her dad worked with the French government as a consul but was short-lived as he battled with cancer and died when Pom was just five. Her parents chose the name Pom because of its similarity in pronunciation to the word spring and tiger in the Korean language. Her father’s job took the family places and Pom lived in Canada, Japan, and Ivory coast before her family decided to settle in France. Pom experienced an ugly childhood as she never experienced the true love and care of her parents as her dad died of cancer while her mom suffered from schizophrenia. So, Pom was raised by relatives like her uncle and aunt. Unfortunately, her uncle who really played the fatherly role in her life also died on her 18th birthday. She started trying to make ends meet by working as a waitress and saleswoman, nonetheless, Pom attended law school after her uncle died but never found fulfillment in the course. She only went to the school in order to satisfy her aunt. Since Pom Klementieff didn’t find fulfillment in law school nor in being a salesperson or a waitress, she decided to give acting a try when she was 19. She started out at the Cours Florent drama school located in Paris and later won a theater competition in which she was awarded a two-year free class. Pom kept at a good pace and made her professional acting debut in the movie Après Lui (2007). Her major role debut was in the movie, Loup (2009). She left the French movie industry and started making head waves in Hollywood and acted in Spike Lee’s Oldboy (2013). The actress took a pause from acting in 2014 and concentrated in learning Taekwondo and is currently a purple belt holder. She resumed acting in 2015 and featured in the film, Hacker’s Game. Afterward, she joined the Marvel Cinematic Universe and acted in the spell bounding movie Guardians of The Galaxy Vol.2 (2017) and also played a major role in the 2018 movie, Avengers: Infinity War. Pom Klementieff has done really well for herself and has also made a fortune. She is currently worth $3 million. There is nothing as painful as losing a loved one, Pom Klementieff has lost a lot of loved ones including her father and her uncle. Recently, the Canadian actress recently tweeted on the loss of her brother. We know that she had other siblings but has never revealed their names. On her tweet in 2017, she said she tattooed her brother’s name on her left wrist as he committed suicide two years back. She hasn’t gotten a hold on herself emotionally but has consoled herself and has also decided to live for him. Well, the actress has taken the affairs of her private life off the records. We wouldn’t know if it is intentional but the damsel has kept the question if she is in a relationship or not unanswered. Some of her die-hard fans have taken up boldness in asking questions on her social media platforms but she has never responded to any in that regards. We could say that she practically keeps a lot of male friends than females friends. Pom has uploaded a lot of pictures containing only her male friends on her social media platforms but as also tagged all as friends. Thus, Pom Klementieff is assumed single but trust we would update you as soon as she lets the cat out of the bag. 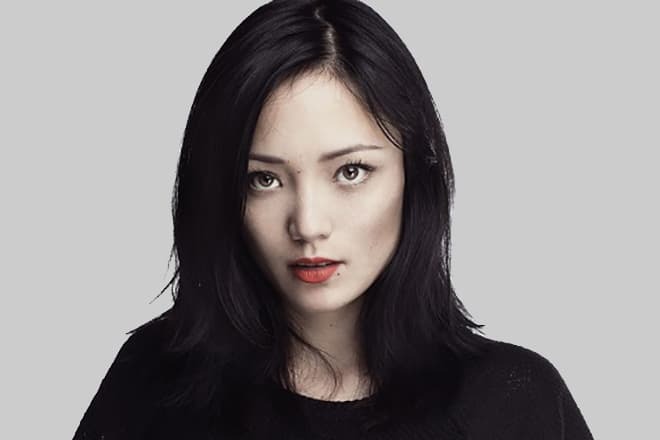 Of a truth, Pom Klementieff has a Korean look and is, of course, a beautiful lady. She stands at 5 feet 7 inches with a balanced body weight of 60 kg. She wears bra size 32b and measures 32-24-33 inches for her waist, chest and hip sizes respectively. Pom likes trying out different hair colors. For her movie Hacker’s Game, she dyed her hair purple and for few of her other roles, she dyed her blond. She has a set of cute charming hazel eyes.